Yes, Eldvar is a world with humans, elves, dwarfs (dwarves? ), orcs, zombies, anthropomorphic animals, and lots of magic. Still, to repeat what I said, “You are missing a good book, game-related or not.” As far as I am concerned, the biggest problem with Into the Desert Wilds (wraparound cover by Darryl Taylor) is that it continues the story from Book 1 without an adequate synopsis of what went before. But that does not matter as much as it might have, because In Wilder Lands ended with the main characters escaping certain death in their forest lands home by being transported to a new, desert land more than a thousand miles away from their enemies. It is a new setting for them and the reader alike. CreateSpace, August 2012, trade paperback $13.99 (436 pages; on Amazon), Kindle $2.99. The four wildlings from in and around the human city-state of Altis are still the main characters. 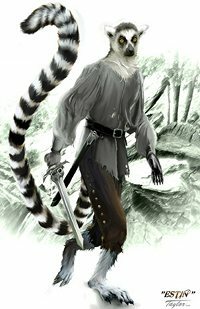 Estin, the protagonist in the first novel, is a “mystery animal”, although the reader will recognize him as a ring-tailed lemur. 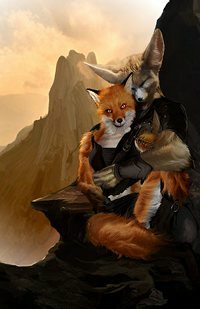 Feanne, his mate, and her children Atall and Oria are red foxes. Galford said that the wildlings in the forest lands around Altis were anthros based on the wildlife of Colorado – bear, deer, raccoons, cougars, badgers, wolves, etc. In Into the Desert Lands, they have inadvertently escaped by magical mists to the desert lands around the elf and human city-state of Corraith. The good news is that the recently semi-ruined Corraith does not persecute wildlings as Altis did. 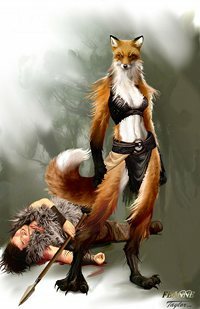 The bad news is that Estin, Feanne, and Estin’s fox-cub foster children are looked upon suspiciously by the Corraithians, who are used to wildlings who are anthro lizards, jackals, vultures, fennecs, and the like. Estin, Feanne, and the cubs set up a hidden den near the city from which they can venture into it. The city guards had little trust for anything they could not readily identify as a citizen. Estin and Feanne’s clothing was at least the right style – loose cloth shirts and pants, with lightweight cloaks to shield their bodies and heads from the sand on the winds – but they were far from discrete [sic] in their appearance. To get an economic start in Corraithian society, Estin is again forced to take jobs with the local thieves’ guild. The thieves’ guild in Altis was always ready to betray him, and Estin does not expect anything better from its Corraithian counterpart. Feanne, who is used to being the pack leader and is not willing to step back even though she is pregnant with Estin’s children, wants him to drop his employment with the thieves who they cannot trust. Estin’s insistence on providing for his family sets up a tension between him and Feanne. Sorry, but spoilers ahead. In Chapter 2, it turns out that the plot is more complex than in the first novel. Estin is the protagonist only in the odd-numbered chapters. In the even-numbered chapters, it is Oria, Feanne’s daughter. Wildling children mature almost as rapidly as wild animals, and Oria and Atall are now 3 ½ years old, or about 14 to 16 in human years. The tomboyish Oria becomes used to exploring alone during the times that Estin returns from the city and he and Feanne have one of their arguments. While exploring some apparently-deserted catacombs, Oria meets Phaesys, a young fennec who is the first desert wildling that she has seen. In Chapter 3, Estin learns that Arturis, the leader of the Turessian necromancers who control the zombie armies that destroyed Altis, has become the real ruler of Corraith. To keep from leading Arturis and his ghouls to Feanne and the cubs, Estin is forced to hide in Corraith without time to warn them. In Chapter 4, Oria learns that the immature Phaesys is really Lord Phaesys Herrouln, the son of the fennec leader of about 150 survivors hiding in the catacombs beneath the city from the magical mists that semi-destroyed it; apparently the same mists that transported Estin, Feanne, Atall, and Oria to Corraith. When Estin disappears, Feanne and the others assume that he has been killed by either the thieves or whatever is behind the mists. With Chapter 5, Into the Desert Wilds splits into two separate stories: that of Estin alone coming to lead a Corraithian resistance against Arturis and his undead hordes, and (from Oria’s viewpoint) of Feanne, the two adolescent cubs, and Feanne’s (and Estin’s) three newborn cubs with Phaesys and the Corraithian refugees who are hiding from the city’s necromantic conqueror. A sudden ruckus up on the walls was followed by the body of a guard falling just inches from Estin. The man’s face and arms were clawed badly and his throat was ripped out. Galford also says that, “Book four should begin pulling the stories and characters together towards the eventual ending …”, so we can expect Estin, Feanne, and the others to return eventually. 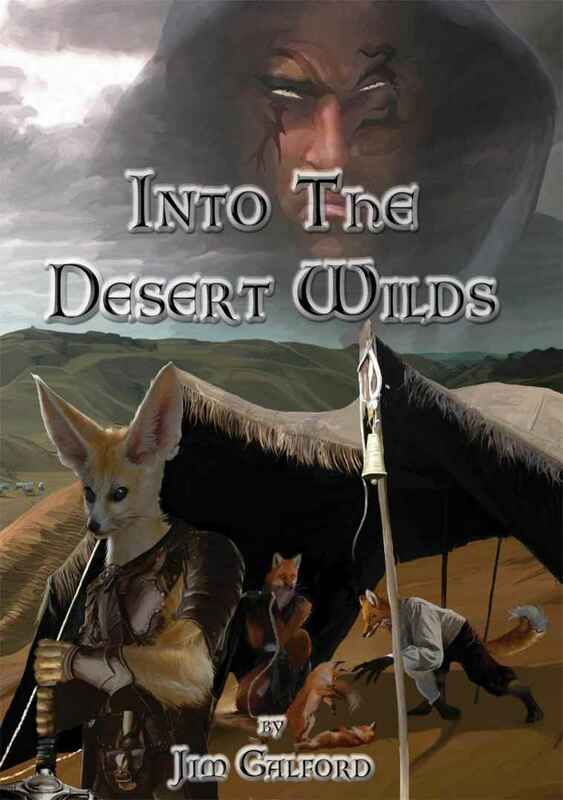 Into the Desert Wilds is so good that, with a cliffhanger ending and the promise of at least a two-year wait to find out what happens next, I am not sure whether or not to recommend that you read this now or wait until Book 4 is available. As for me, I have read Into the Desert Wilds so I cannot resist getting Book 3 as soon as it is available. At least I can count on it being a really high quality adventure fantasy.